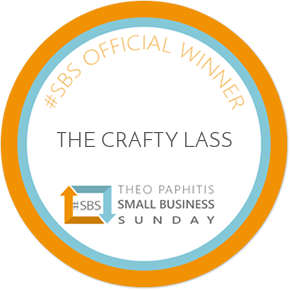 The Crafty Lass reports into new ‘Boss’! I have had many a different role in my career to date… From envelope stuffing and data entry on oil drilling (random I know!) to pot washer and waitressing… shop assistant, accounts, chocolate forecasting… from working in womenswear fashion buying and merchandising, to number crunching on predicting foodie sales for a national supermarket, guest demonstrating on shopping TV and most recently as a Craft Buyer – and importantly, realising my actual long term career dream – and setting up my own craft workshops business – ‘The Crafty Lass’. I wouldn’t perhaps class ‘motherhood’ as a job – but I would certainly class it as a role – and work! I have (strangely or not) always loved working (born on a Saturday – “Saturday’s child works hard for a living”?) and it is a novelty to me being on maternity leave. It isn’t really a year long holiday – but it does sometimes feel that way (!) – it is definitely play dates, new things to see, learn, try and do – and plenty of tea and cake. I don’t have an Easter four day ‘weekend’ off from ‘work’ – but I do have a lovely four days together as a family. I am simply – loving – this new stage in our life – the good, and the bad! What I am losing in sleep – I am gaining in daily new adventures and discoveries. Carer, Chef, Cleaner, Nurse, Chauffeur, Event Planner, Photographer, Teacher, Stylist and Entertainer. Full-Time Long Term Contract. Please note you will be required to be on call 24 hours a day, and available at very short notice. Primary role of The Parent is to ensure The Boss is ‘happy’ by any means necessary. Target of ‘happiness’ measured by a distinct lack of ‘grouchiness’. You must be able to work out what The Boss is saying and requiring, often via ‘instinct’. This cannot be taught, but it will be something you ‘just know’. Please note sometimes you may not ‘just know’ – so you will need to be inventive, ask everyone you know questions, be prepared to search Google umpteen times and try various ideas and activities. In addition to generally caring, changing and feeding – happiness is often achieved by (but is strictly not limited to) cuddles, playing with toys, singing, jigging, pulling funny faces, repetitively saying ‘boo!’ and dancing around like a crazy person. Please note that within each 24 hr period, how the overall happiness target is achieved will need to adjust and will often dramatically change. What The Boss may love today – may not work tomorrow – so you will need to show adaptability and ability to think on your feet whatever the circumstances. You will need to demonstrate a high ability to multi-task and must be able to accept – and be prepared for a change of plans at a moment’s notice. Must be able to determine and structure when it is The Boss’ ‘Nap’ and ‘Bed’ Time. Gently rock The Boss from side to side continuously, for what feels like hours, no matter tired you are, or how big and heavy they become. Read the same bed time story from yesterday (and the day before) as if you’ve never read it before. With different and varying character voices. Sing the same song over and over (and over). Please note – that song will be stuck in your head for days. On occasion, go for a walk or drive, for no reason other than to induce sleep. NEVER run out of batteries of The Boss’ toy that sings sleep inducing lullabies. NEVER lose The Boss’ favourite toy and/or ‘comforter’. Be able to always locate said toy and/or ‘comforter’ at ‘Nap’ and ‘Bed’ Time. Must wash, dress and style The Boss, and be prepared to accept that they will have more outfits than you, and ultimately – look (a lot) cooler than yourself. You must be willing to get excited about seemingly mundane things like cardboard boxes – especially when they reject a new toy that came within said ‘cardboard box’. You must be willing and able to organise, pack and carry around a hundred and one items with you every day to cover anything and everything The Boss may require. – You will need to cope with changes in acceptable conversation topics. You will likely no longer talk about anything other than The Boss. You must also be willing to discuss anything and everything at any given moment – nothing is out of bounds. For example: topics such as ‘poo colour’, ‘poo consistency’ and ‘poo amount’ are acceptable across the dinner table discussions. – You will more than likely require an upgrade to an almost indefinite storage capacity for your photographic device to cope with the high amounts of photos taken of The Boss. Please note you are likely to often share a lot of The Boss photos with the world – perhaps via social media. Other people may love this and others will get bored, but please continue to share at whatever level you feel is appropriate in The Parent role. – You may need to adjust your own sleeping patterns – sleep when The Boss sleeps if required. – You will have a budget – however you do need to be prepared to make considerable purchases to undertake the role. Please note – just when you think you have bought everything you need, The Boss may undertake a ‘growth spurt’ and require a completely new wardrobe, overnight. Please also note a lot of what you purchase may not actually be necessary, liked or required. See note on ‘cardboard box’ above. Please also note no formal training will be included with the role and it does NOT include a manual. Breaks: You are entitled to daily breaks however you will need to be flexible on this. Your breaks usually need to fit around the (sometimes non-existent) ’Nap’ and ‘Bed’ Time (see notes above). Please note you will have to be prepared to drink cold cups of tea if necessary. Holidays: you are entitled some holidays. Requests for such will need to be considered on a case by case basis – however, you will still be required to be on call (see ‘Hours’ above). Promotions: When you are ready you may report to more than one of ‘The Boss’. Pay: You won’t be on any numerical remuneration. However, you will get paid in unlimited unconditional love, smiles and giggles. This job description is not exhaustive, but it is exhausting. We understand that this is a highly challenging role that will require a patient and loving candidate to fulfil. However, it promises – above all – to be extremely rewarding and heart meltingly brilliant. In fact – it guarantees to be the best job you will have ever done and will ever do.